Impact 5-in-1 Collapsible Circular Reflector Disc - 32"
The Impact 5-in-1 Collapsible Reflector Disc is versatile in the field and in the studio where it provides shadow-lightening detail in your subject, using available or studio lighting. It starts out as a translucent white disc -- suitable for softening direct sun or lights without diffusion. Use the removable, reversible zippered slipcover to reflect light into shadow areas of your subject. Your choice of color -- silver, gold, white, silver/gold mix -- will be determined by the lighting conditions, and your personal preference. This 32" disc is suitable for 2-person portraits and small still-life setups. It folds down to 1/3 its open size and comes with a storage sleeve. We suggest the purchase of a pivoting arm and stand to hold the disc where needed -- especially if you are working without an assistant. Soft Gold combines gold and silver, creating a warm, summery feel that works great with skin tones. Silver increases the specular highlights and yields a high-contrast image. Its perfect for video, product shots and B&W photography. 5-in-1 Collapsible Circular Reflector Disc - 32" is rated 4.6 out of 5 by 211. Rated 5 out of 5 by Anonymous from So far so good! So far (and I have only used these for a couple outdoor portraits) I'm very happy with them. The price is great!! They are convenient to use. I will take caution not to over use or abuse the zippers as these reflectors can tend to wear out there first, but I think with gentle use and good care they should last plenty long enough to easily make them worth the price. They sure are fun to use, and the effect is dramatic for brightening faces (or subtle if you want it to be). The five in one allows you to get the effect you want. I really don't feel this is something you need to overpay for, you can easily get the effects you want with this product. Rated 3 out of 5 by Jason - Filmmaker from Decent Value I was shooting a student film in natural light and needed silver and white reflectors for to provide some fill. As we had no budget I was looking for something portable, versatile and under $50. This certainly filled the bill. I also used it on a different shoot as diffusion for a 650 fresnel. My only concern is it's durability. 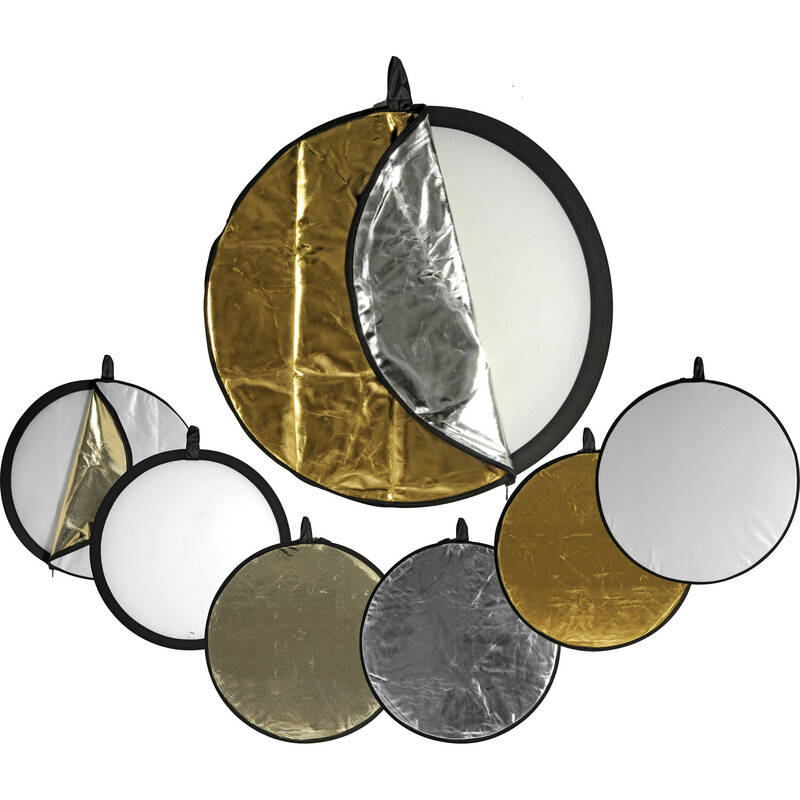 I have used other collapsible reflectors before and this one seems to be more flimsy with a plastic frame feel. The zipper on the cover feels fragile. That said, if you're short on budget, this reflector will work nicely. Rated 4 out of 5 by shinyhappycarrie from easy to use and worth this reflector is a great addition to my gear--I love the difference it makes! it really helped brighten the eyes and even out the lighting, which is exactly what I hoped for. and I enjoyed trying out the different colors (I found the gold/silver works best for me, so far!) the only negative is that a 32 round reflector is a bit ungainly when you're walking around, especially on a windy day, and it's a bit of a bear to fold up--BUT I'm sure that soon enough folding it won't be a problem and I can easily use the handy-dandy hang bag that came with it when I'm walking around. overall a really good value for the $$$! Rated 5 out of 5 by Ponymon from Ease of conversion The main quality of this product that I would like to comment on is the ease of which you can convert the reflector over to the 5 different choices. Unlike another smaller 5 in 1 reflector (different brand) that I own this one has a slot to put the black cloth holding tab through to take the guess work out of positioning it in the proper place so that it zips up right. Also, it has just a little bit of slack in the looseness of the fit so that it is easier to zip it up around the frame, making change over time much quicker. Rated 4 out of 5 by Anonymous from Super Reflector at a good price Use it in my studio. Works great, very effective. Really like the versatility this product provides. I can reflect light using the silver, gold or herringbone sides or diffuse light from the sun or strobe. Changing from on surface to the next is simple and takes little time. Only con is that using the style holder I have (avenger that clamps onto the reflector by the thin black rim around it)the zipper prevents it from clamping on one side. So you have to pull the zipper to the side a little so it will clamp firmly. Rated 5 out of 5 by Anonymous from Great! I was able to use this reflector when I was taking head shots recently for an actor. I was very pleased with how easy it is to carry around. In fact, after you fold it up, it being FIVE reflectors, you can stash it in a small bag as I do. I have my camera and the reflector in the same bag at the moment and I bring around the city. My favorite reflector would have to be the silver side. It all depends on what you are looking for though. It gets rid of shadows just the way you want! Rated 5 out of 5 by Joe meets nature from Perfect size I have mostly used this product for shooting films on my DSLR. I have studio lights and we use natural light often and this reflector has helped add filler for all situations. We have filled shots that simply have too large a dynamic range and we block the light with it when the sun is too bright. One problem that I have faced in the past is having it catch wind like a kite when shooting outside. I have found that the 32in reflector is much less likely to blow away or pull you than the 42in. It is also still big enough to reflect what we need when we need it. Overall, I would say that the price is low, the value is high and it is definitely something you will be thankful to have sitting around when you are working on projects. Can anyone recommend an appropriate reflector holder for this 32 reflector? I want to put it on top of a tripod/light stand but all of the reflector holders seem to be for 60 reflectors and that seems like massive overkill. Impact makes one (Impact Telescopic Collapsible Reflector Holder) but that is way too big. Looking for something cheap that will collapse small. A smaller and less expensive reflector arm that we offer is the SP Studio Systems Universal Reflector Mounting Arm B&amp;H # SPMAUR. Please see the image below for reference.